The 14th October this year marked the 76h anniversary of the first flight of the Curtiss P-40, which took place in 1938 at Buffalo, New York. It was to become an important Second World War fighter, though often forgotten in favour of its more famous cousins. The P-40 was used in a number of theatres, most notably in the Africa and the Pacific. The most regular performer on the circuit, Peter Teichman’s P-40M “Lulu Belle” G-KITT was the second P-40 to be imported into the UK for displays, brought over by Stephen Grey, in 1985. The “M” version features a longer fuselage, a development brought in on later examples of the type to deal with the increased torque from the bigger engines. G-KITT at Headcorn in the Aleutian tigers scheme she wore until 2009. Having flown with The Fighter Collection (TFC) for 10 years until 1995, it moved across the channel to France. It was back at Duxford in 3 years time however and remained with TFC till 2005, when “KITT” moved down to North Weald to join Peter Teichman’s Hangar 11 Collection. Wearing the temporary “Red Tails” scheme at North Weald. G-KITT has been seen in many schemes over the years, perhaps the most memorable is the Aleutian Tiger scheme, with the distinctive yellow tiger nose art. The aircraft remained in this scheme until 2009, when temporary markings were applied for the Red Tails movie. This temporary paint was left on the aircraft, which became known as “Clawin’ Kitty.” In 2013 the aircraft was finally repainted permanently as Lulu Belle, a distinctive scheme she still wears today. Despite having been the most commonly spotted P-40 on the circuit for the last few years, she was noticeably absent for the 2014 season due to engine troubles, hopefully she will return next year. For the rest of the country’s Curtiss Hawks we need only take a short drive up the M11 to The Fighter Collection at Duxford, where Stephen Grey currently has a trio of Hawks. 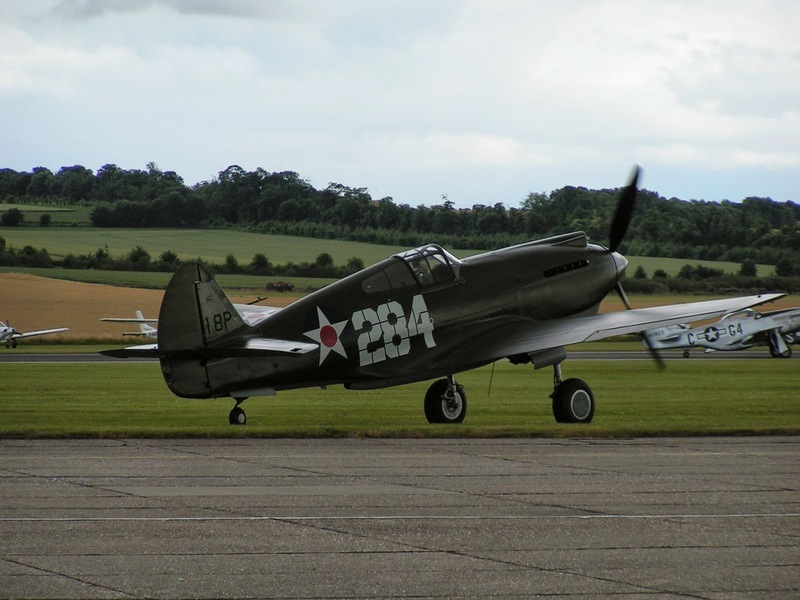 TFC’s P-40C on tow at Flying Legends 2014. The collection’s most recent arrival is the wonderful polished metal P-40C N80FR. A rare early example of the type, featuring a “long nose” Alison engine, giving a very different profile. The aircraft’s unique colour scheme represents an aircraft used as a Squadron “hack” aircraft for base commanders at Chanute, Kansas in 1940. General opinion seems divided about the paint scheme, personally I love it, as it harks back to the prototype examples, but I’ve heard many others say the exact opposite. 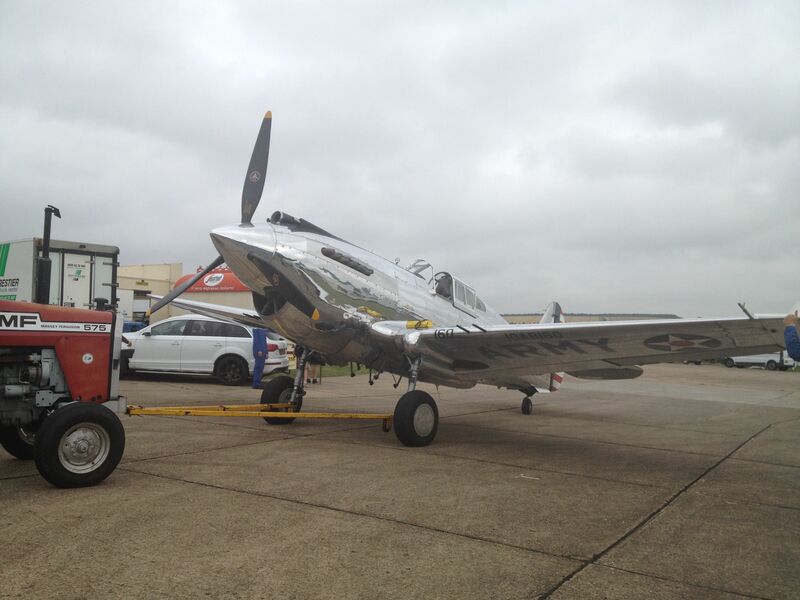 It made its UK debut at the 2014 Flying Legends airshow in the hands of Stevo Hinton. Due to technical issues this was limited to a very short performance on the Saturday of the show, but it certainly left an impression. Having waited since 2012 for the P-40 to be shipped over I am sure I speak for many when I say it was a pleasure to finally see it in UK skies. The aircraft is currently undergoing maintenance ready for next year’s displays. “Lee’s Hope” showing topside at Duxford in 2011. Arriving in 2011 was the unique P-40F G-CGZP, one of only two airworthy examples in the world. The F model differed from all the other marks of P-40 as it was powered by Packard Merlin engine, as in the Mustang and Spitfire, rather than the traditional Alison. This was a modification made during the war to increase the types performance. There is not much information about the aircrafts service history, other than being shipped out to the 13th Air Force in the South West Pacific in 1942. There is then no recorded history of the aircraft until being dumped on the island of Espiritu Santo in November 1943; the aircraft was recovered in the 1970s. Following recovery, the aircraft was stored until restoration work could begin. 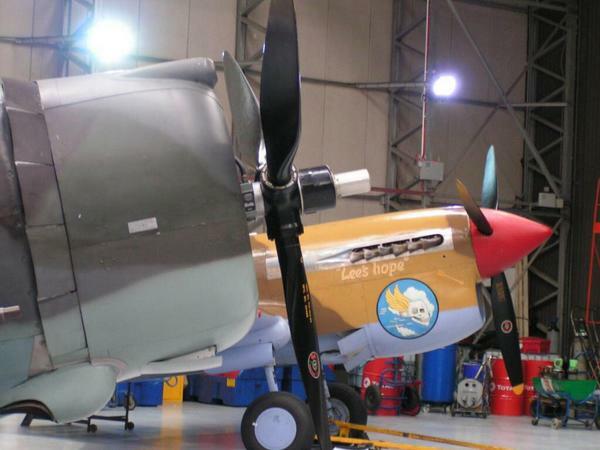 The aircraft is painted in arguably the best looking scheme a P-40 can wear, desert camouflage, and represents “Lees Hope” which was flown out of Southern Italy in 1944. 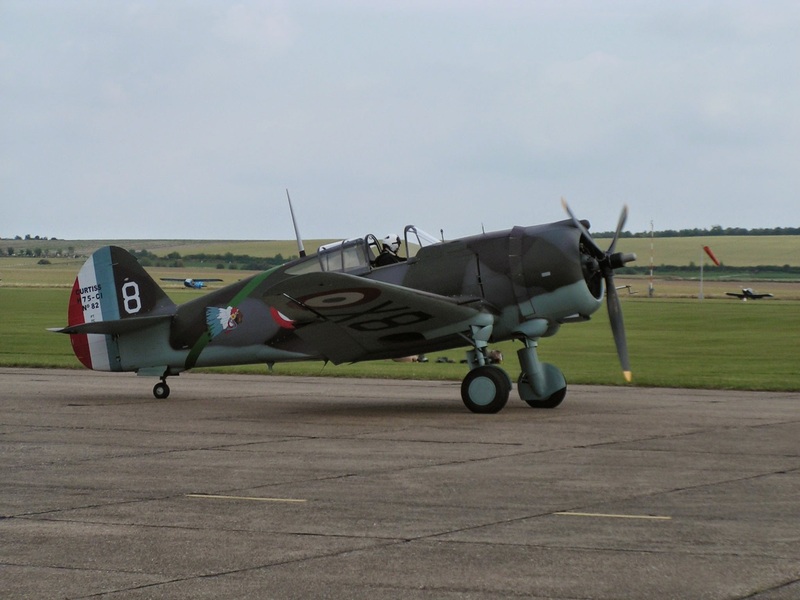 The aircraft was rebuilt in Australia and since making its debut at Flying Legends 2011 it has made many more memorable appearances, especially when in the hands of its owner, Stephen Grey. The addition of the Merlin engine to the aircraft certainly seems to make it an impressive performer. In my eyes, the prize of the Fighter Collection’s trio of Hawks, if not the whole collection, isn’t even a P-40 at all. 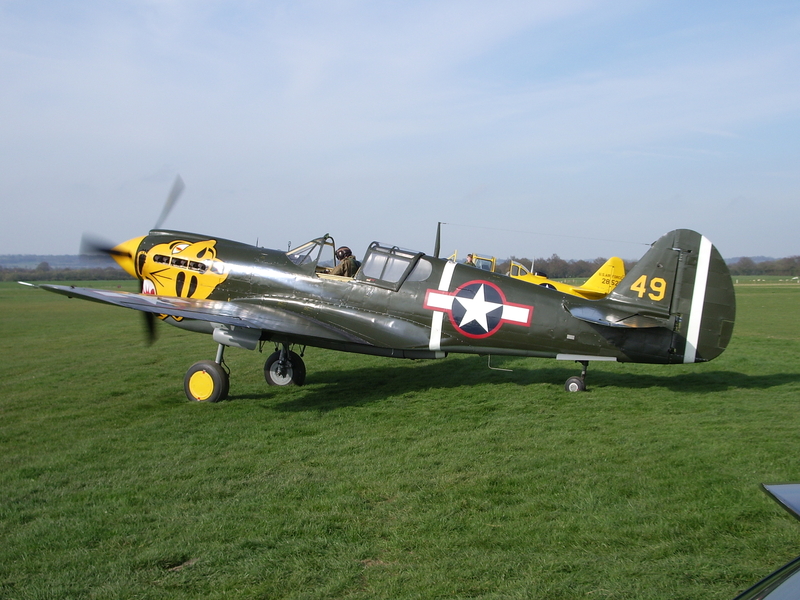 The Curtiss Hawk 75, (P-36) is the radial engine predecessor to the P-40 line of aircraft. It shares a number of the same features, including a wing and tail shape as well as the unique undercarriage retraction, for which the P-40 is renowned. The Fighter Collection’s machine, G-CCVH was one of the 100 initial aircraft to be shipped out to France (No.82). After time spent in Algeria, Tunisia and Morocco, the aircraft ended up as an advanced trainer in Western France, being saved from the scrap man in the 1950s. Stephen Grey acquired the aeroplane in 1995 and it made its display debut display at Flying Legends in 2005. The Hawk is always a fascinating aircraft to see display and is kept in beautiful condition; it is one of only two surviving complete examples in the world. The three aircraft currently with the collection provide the unique ability to fly formations showing the Curtiss lineage from the P-36 (1935 design, built in 1939) through to the later model P-40F (1941). This is something no other operator in the world is able to offer. 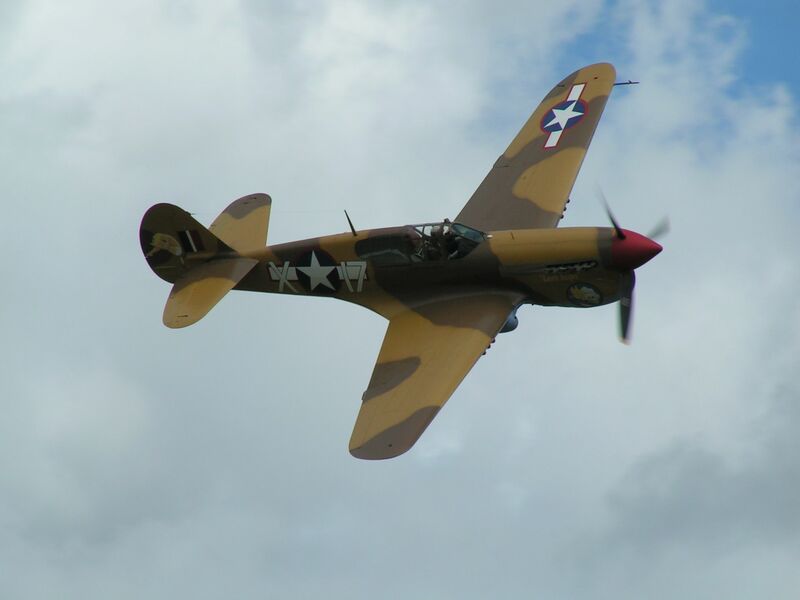 Ray Hanna’s Old Flying Machine Company was responsible for bringing the first P-40 on to the UK airshow scene. In 1984 they brought the aircraft over from the states and operated it for a number of years performing at displays across Europe. The aircraft was shipped back across the Atlantic in 1989. It went back to the Warhawk Air Museum and remains part of their collection to this day. The Old Flying Machine Company’s P-40E ZK-RMH, which moved to Duxford in 1998. The aircraft was flown season after season as part of the famous Breitling Fighters team, led often by the P-40 with Ray Hanna at the controls. 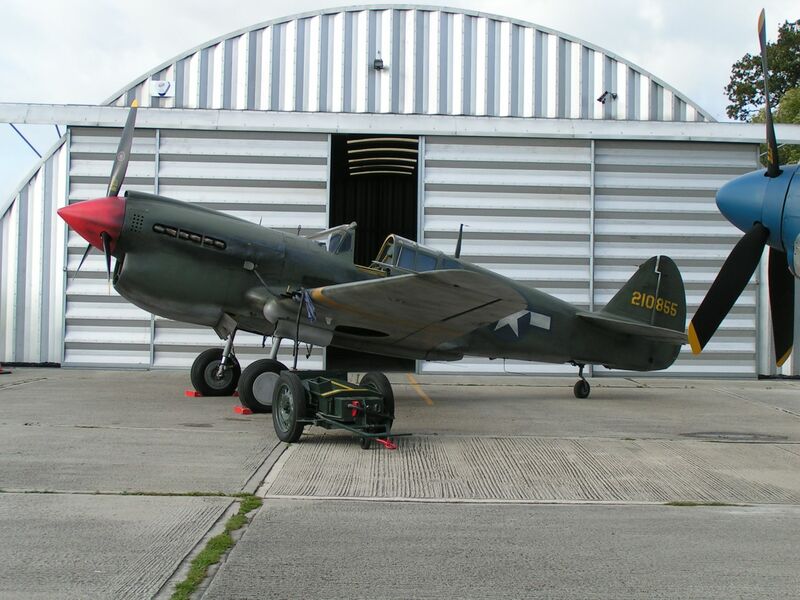 With the end of the Breitling deal in 2003, the Old Flying Machine Company downsized their collection and along with a Corsair, the P-40 returned to New Zealand. A more recent departure was that of The Fighter Collections P-40B G-CDWH, which left earlier in 2014, bound for the Collings Foundation in the States, quite rightly, many would say, as the aircraft is one of the few airworthy Pearl Harbor survivors. The aircraft was present during the raid and though it was on the ground throughout, it is still an important part of American History. The “B” is also the oldest airworthy example of the type and another great example of the “long nose” variant. I have developed a real love for these Curtiss types over the years, in many cases they were the unsung heroes of the war, getting nowhere near the press and prestige that the Mustang and Spitfire did. Many pilots have put on memorable performances in the Curtiss fighters; especially Ray Hanna, Stephen Grey and Peter Teichman have shown what a wonderful aerobatic and low-level machine the aircraft is. It has been interesting to watch as the UK population of these unique aircraft has grown over the years, thanks largely to Stephen Grey. I for one hope this trend continues and we can see some more of these wonderful Curtiss’ performing at British airshows. Much of the Information gathered here is from the operators websites as well as my own recollections. If you have enjoyed this post and would like to see more like it, have a look in the “Warbird Stories” section of the website.